While the French New Wavers were running around Paris with their handheld cameras reinventing cinema, fellow French filmmaker Jean-Pierre Melville continued to make his classical Hollywood-influenced Euro-cool crime pictures, including films like Bob Le Flambour, Le Samurai and Le Deuxieme Souffle. Sandwiched into these stylish films is a remarkably gentle and quiet picture, Léon Morin Priest, featuring Jean-Paul Belmondo as a handsome priest who has a profound effect on a cynical widow in Nazi-occupied France. Barny (Emmanuel Riva) is a recently widowed mother to a young daughter living like many of her girlfriends – scared witless for her family’s future in her Nazi-occupied village. With Jews being extricated from the village and her being half-Jewish, Barny needs to find a new identity. For women like her, the only option is conversion to the Catholic Church. Walking into the Church she confesses for the first time at random to Léon Morin (Belmondo), a deeply thoughtful and impossibly handsome priest. As an atheist, Barny initially intends only to fake her way through the conversion process for the sake of her and her daughter. But given the combination of Jean-Pierre’s persuasiveness and attractiveness, Barny gradually becomes a true convert and by the end she is completely devoted to God. The film begins and ends with a naughty and sexual tease of then New Wave heartthrob Jean-Paul Belmondo as a man-in-frock. Belmondo’s rugged and untraditionally handsome face, even with these heterosexual eyes, is the stuff of dreamy Hollywood. Imagine bad boy Steve McQueen wearing a frock and a reverse collar? This is not The Thorn Birds though. 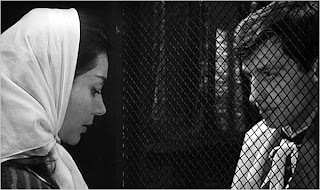 Melville’s screenplay (based on Beatrix Beck’s novel) is one of the most devout and intellectually rigorous films about religion I’ve ever seen. The near two-hour running time is filled with numerous lengthy dialogue scenes between Barny and Morin discussing the contradictions and attractions of Christianity. At times overly intellectual and at other times spiritually stimulating, the film doesn’t quite hold us through its excessive 117-minute running time. At the very least, this film is something to be cherished for its place in the filmography of one of France’s best filmmakers. It’s an elegant and heartfelt transition to something personal to Melville. The theme of the French resistance also connects well to Melville’s Army of Shadows (1969), as they are two films about the passionate fight for freedom. One is about guns and bloodshed, and the other, in this case, is about a spiritual awakening and liberation of the soul. Léon Morin Priest is available on Blu-ray from The Criterion Collection. I love this movie. It's rigorous to be sure, but there's a part of me that wishes filmmakers would still tackle issues of faith as intensely as Melville does here (and certainly as many others did including the inimitable Dreyer). Today, more than ever, these issues need to be addressed, but not in the knee-jerk anti-faith slant one finds in so many populist documentaries, but with the kind of intelligence, thought and even - dare I say it - ambiguity. Not ambiguity in terms of how the drama unfolds, but a more subtle form that invokes thought and perhaps discussion AFTER one watches the movie. As you well know, ambiguity is often used by contemporary art film makers - especially young ones - in all the wrong ways. It's murky instead of thought provoking and while the film unspools, the questions it asks (or unintentionally asks) just take you out of the drama. Indeed Greg, I appreciate the movie for the same reasons (and Belmondo). It's a challenging movie, but not alienating. The dialogue is terrific. For something like this, I do feel it's silly to even assign a star rating (much like Black Moon). While I didn't 'love' it, it's an important film from a great filmmaker.